The Danish Energy Association (DE) has warned that the Danish power plant capacity by 2020 will be only half the capacity expected by the Transmission System Operator, Energinet.dk. DE calls for more transparency on the capacity planning. The CEO of Energinet.dk, Peder Østermark Andreasen, argued in a radio interview on the 3rd January 2013 that the future security of supply will be adequate due to CHP plants (combined heat and power) and interconnections. He also emphasized that Energinet.dk is responsible for the security of supply for electricity and gas in Denmark. The publications from Energinet.dk are not very specific on the future security of supply. According to fig. 7 in "System Plan 2012"  the Nordic capacity balance will be positive in 2020, but the Danish deficit will be 810 MW. The figures come from a report from the European organization for system operators, ENTSO-E. The data was collected in October 2011. At that time PV was not yet expected to have any significant capacity, not even in 2025. The difference between total capacity and reliable capacity is specified as "Non-Usable Capacity", "Maintenance and Overhauls", "Outages" and "System Service Reserve". The question is if 6,630 MW is a realistic estimate of the fossil fuelled capacity in 2020. The Energinet.dk web site publishes data for planning. The power plants are listed for 2013. A summary of the list is shown in the table. In order to be able to operate the capacities stated in the ENTSO-E data some of the mothballed plants must be reopened. The local CHP plants have some privileges which will be phased out before 2020. At the same time many local power plants will require new investments due to wear and tear. Many of these systems may prefer a conversion from CHP to biomass fired boilers. The loss of capacity could be anything between 0 and 2,632 MW. It could also be a fair estimate that the mothballed capacity will not be available for service again. In that case only 3,344 MW fossil fired capacity will be available in 2020 and not the 6,620 MW expected in the ENTSO-E data. The case illustrates that a 50% reduction of the thermal capacity in 2020 cannot be excluded. Wind power has changed the production pattern for electricity in Denmark. Heat demand and power system security are decisive for the operation of thermal power plants. The result is a surplus of power during the cold seasons and a deficit in the summer. Imbalances are as a main rule exchanged with the neighbouring countries. The thermal power plants are still needed for covering peak demand periods without wind, but the average capacity factor for the thermal power plants is low and still falling. Therefore the mothballing policy is understandable. Even if it should be decided to take the mothballed units back into service it is doubtful if the necessary crews can be mobilised. In the long run the consequence of this development will be that supply of electricity in Denmark depends on import. The CEO of Energinet.dk, Peder Østermark Andreasen, said in the radio interview that market signals will make power plant investors decide new capacity when needed. This is true, but it will take additional market arrangements, for instance a so-called capacity market. It will also take a new type of power plants. Most of the existing power plants have been designed for base load operation. The selection and construction of a perfect peak load plant for the future power system will be a major challenge. The Danish Energy Association (DE) represents the power plant owners. They are challenged by decreasing demand for their production and declining income. Recognition of the need for guaranteed capacity could lead to capacity payments and additional life time for the existing power plants. A capacity payment must be paid by the system operator, Energinet.dk. However, Energinet.dk seems to prefer the installation of new interconnectors in order to postpone the introduction of capacity payments. 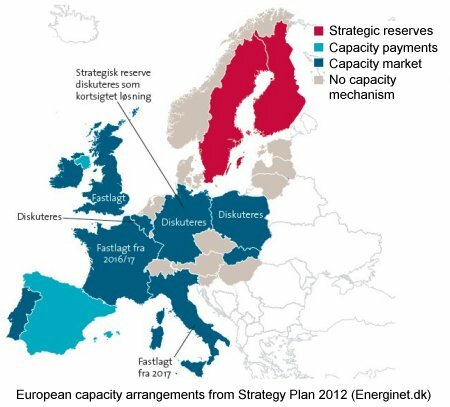 The "Strategy Plan 2012"  from Energinet.dk discusses the European capacity arrangements. It states that Denmark maintains a high security of supply due to the strong interconnections and the integration with the European electricity markets. This strategy creates uncertainty on the development of electricity production in Denmark and on the future security of supply. It may also cause a reduced combined production of heat and power which was so far an essential part of Danish energy policy. The implementation of a capacity market requires several years. The British capacity market was introduced in a white paper  in 2011. It is expected to be effective from 2019 but could be brought forward, if required. After 2020 the capacity balance is expected to be negative in both Denmark and Germany. A continuation of the present policy will create an international competition on buying both capacity and balancing services. This situation could be very expensive to Danish electricity consumers. Denmark has a fleet of very efficient power plants. The heat supply for the district heating systems depends on this fleet. From the 2020s a new generation of flexible, clean and efficient power plants will be needed for the future production of electricity and heat. It is time for preparing the generational change. A first step could be an open strategy for the development of the supply structure and for encouraging the necessary investments.